A healthy food item that always seems to be a luxury is salmon. Whether it’s lox on my bagel with cream cheese for brunch or baked and served with delicious sides for a fuss-free dinner entree, I feel as though I am being treated to a luxurious meal. So when I first made Barefoot Contessa’s Panko Salmon with French Lentils, I was quite impressed. 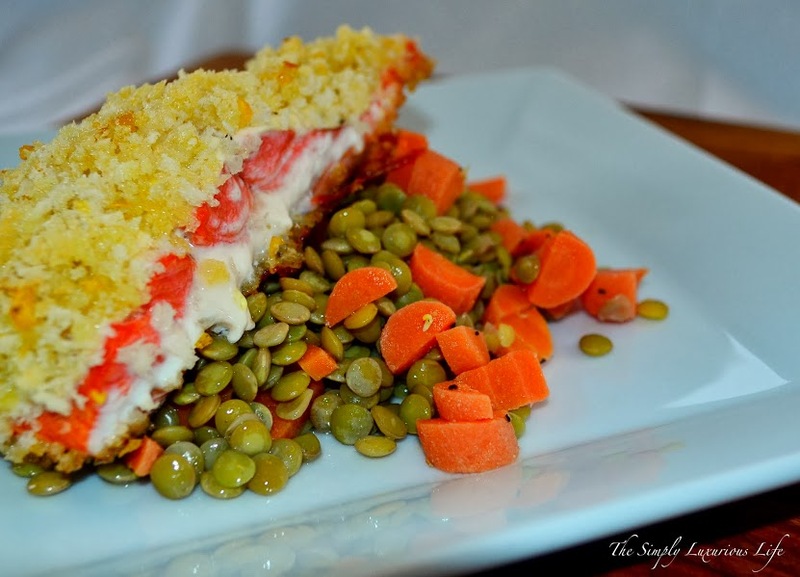 With the panko holding in the flavorful moisture, the searing adding that ideal amount of crunch and the lentils contributing a smooth rich flavor that pairs wonderfully with the fish, this recipe quickly moved to the front of my recipe notebook. *The listed amount of Dijon mustard below was too much for my taste buds, so I ended up mixing it with equal parts of mayonnaise. This mellowed out the Dijon, but still retained the moist, rich flavor. *A quick and simple meal that at first glance looks deceptively tricky. 1. Place the chopped shallot to a warm skillet with 1 tablespoon extra virgin olive oil until nearly transparent. 2. Add 4 cups of water to this skillet with the shallot. Bring to a boil. 3. Add carrots, and simmer uncovered for 20 minutes. (If necessary, drain the lentil mixture). Add the vinaigrette, dijon mustard and creme fraiche while the lentils are still warm (but the heat turned off). Stir to combine. Serve warm. 3. Place the salmon fillets, skin side down, on a board. Generously brush the top of the fillets with mustard and mayo mixture (about 1 heaping teaspoon) and then sprinkle generously with salt and pepper. Press the panko mixture thickly on top of the mustard/mayo on each salmon fillet. The mustard and mayo will help the panko adhere. 5. Transfer the pan to the hot oven for 5 to 7 minutes, until the salmon is almost cooked and the panko is browned. Remove from the oven, cover with aluminum foil, and allow to rest for 5 to 10 minutes. Serve the salmon warm, over a bed of French lentils. Garnish with lemon wedges. This looks simply succulent! I will definitely make this in the near future. Do you have any suggestions to replace the panko if I cannot find any? Absolutely! While some would suggest breadcrumbs that you can purchase at a store, in order to have a similar texture to that of Panko, I’d take some bread (2-3 slices) and place them in a food processor, pulse 3-4 times until it resembles . . . well, breadcrumbs. By doing this, they will be fresh and have a crunch, but no gravely bite. However, when I began looking for Panko, I too thought I’d never be able to find it, especially living in a rural town, but I was surprised to find it in a basic grocery store. Just check the cooking aisle. This looks so delicious and it incorporates two foods I’m trying to eat more of…salmon and lentils! Yum! I will definitely be trying this recipe soon! Thanks for your quick response, will definitely give it a try! Tried it on Sunday, not only did it take very little time compared to what I expected, but it was also absolutely delicious! I used breadcrums for the topping, next time I’ll try to add pine nuts!